Donate your services, donate goods, or make a monetary donation. Our Holiday Program to ensure every child has a joyful Holiday Season. Devoted to supplementing the nutritional needs of families at risk for hunger. Year-round program for any child in Norwell whose family may be having difficulty providing some necessities. The Friends of Norwell assists families, children and individuals in Norwell. With the support of generous individuals, businesses and churches, our organization serves about 250 adults and children in Norwell every week through The Norwell Food Pantry & Closet and Kids-in-Need. For the Holidays, our Adopt a Family Program helps to fulfill gifts requests for over 100 families. The Norwell Chamber has a history of giving back to the community. 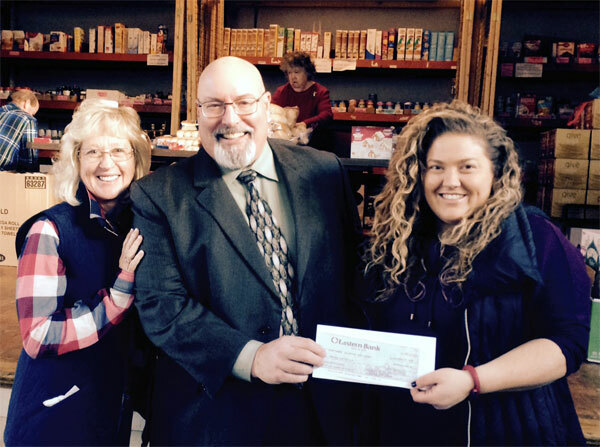 Each year the chamber donates to the Norwell Food Pantry, and 2015 is no exception. 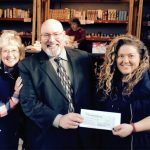 Jack Burke, President of the Norwell Chamber of Commerce dropped by the Norwell Food Pantry to give a check to Alicia and Kathy Tedeschi. If you are interested in helping out this year, please email us at norwellfp@aol.com , let us know how many people you would like to adopt. For those of you who might not be interested in adopting but would still like to contribute we can always use gift cards, these are some of the locations that are requested the most, Target, Wal-Mart, Gas Card, Shaws, Stop& Shop, Hanover Mall etc. All gifts need to be wrapped and labeled and dropped off at the Food Pantry at Town Hall on Tuesday December 18, between 9:30-3:30. You can contact the Adopt a Family program at norwellfp@aol.com or by calling 781-690-5050. Best Wishes and thank you all for your support! 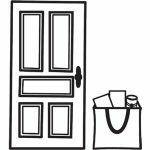 Adopt a Family To help make sure the Holiday season is bright for all families, the Norwell Food Pantry organizes the Adopt-a-Family program each year to match sponsors with families in need. Recipient parents give the Food Pantry a “wish list” of clothing and toys for each child. The food pantry matches up sponsors with children, (sponsors may choose to adopt one or all the children in a family) and the sponsors bring the toys and clothes to the food pantry. The program begins in November each year, and gifts are delivered to Town Hall mid-December. . You can help in two ways, make a donation , or Learn more about Adopting a Family.